A high school volleyball team must overcome the loss of their team captain in order to repeat as state champions. 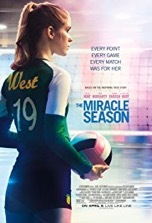 The movie’s opening line is the perfect introduction to its central character, the vivacious captain of a women’s high school volleyball team, Caroline “Line” Found (Danika Yarosh). Caroline’s ebullient personality is infectious; she makes friends with everyone she meets, even players on opposing teams. Coming off an emotional state championship win the year before, Caroline and her teammates have aspirations of repeating. After rolling past their first opponent, another championship seems all but assured. Then comes the tragic night when the news of Caroline’s fatal driving accident sweeps through the community like wildfire. The grief-stricken volleyball team’s hopeful quest for a second state championship comes to a devastating standstill. But with motivation from their inspiring coach and a resolve born out of their desire to honor their fallen friend, the players channel their anger and guilt into one all-consuming goal: “Win for Line.” Based on the true account of how the Iowa City West High School women’s volleyball team won the state championship against all odds in 2011, The Miracle Season is a strong character piece that also features some pulse-pounding action during several volleyball tournaments. Season is a deeply moving story about finding the courage to carry on after a tragic loss. Despite its similar theme to We Are Marshall (2006) and similar plot to Hoosiers (1986), Season is an inspirational sports movie where the miracle on the court pales in comparison to the one that takes place inside the hearts of the grieving players and community. Directing- The man responsible for keeping the character moments meaningful and the volleyball game sequences taut with excitement is director Sean McNamara, who also helmed the tragedy-turned-victory sports film Soul Surfer (2011). Acting- The cast is an eclectic mix of established and new actors. Big screen notables like Helen Hunt (who also starred in Surfer) and William Hurt are joined by some truly fine young actors like Yarosh (Heroes Reborn) and Erin Moriarty (Jessica Jones). Jason Gray-Stanford (Monk) also delivers a memorable performance as assistant coach, Scott Sanders. Story- Ensuring that the sports elements didn’t run away with the story are screenwriters David Aaron Cohen and Elissa Matsueda. Cohen was already familiar with the genre, having co-written Friday Night Lights (2004). Costumes/Make-up- Standard, skimpy volleyball outfits, but the rest of the movie’s wardrobe is appropriate. Cinematography- The locations surprisingly resemble the Iowan countryside even though the movie was filmed in Vancouver, British Columbia, Canada. These locations add a great deal to the team’s road trips, especially during the snow angel scene. Music- The evocative trumpet arrangement in Roque Banos’ score perfectly captures the film’s bittersweet aspects. The crowd singing Neil Diamond’s “Sweet Caroline” at the end of the movie is a nice touch. Production Values- The various production elements are respectable, especially when considering the movie’s modest budget. The school/gym interiors are authentic and the Found’s house and barn sets are functional and homey. Movie Magic- If you enjoy high-energy sports flicks with quick cuts that amp up the action, this movie is for you. Although the story does get a tad Hallmark-y at times, it’s a clean, inspirational film that spotlights one of the more remarkable stories to have come out of the world of high school sports in recent years.